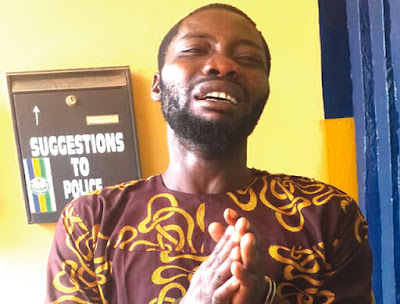 The Ogun State Police Command has arrested a suspected kidnapper, Odele Tosin, for allegedly masterminding the kidnap of a 12-year-old girl, Eniola Oyekanmi, in the Ketu area of Lagos. The victim was said to have been kidnapped on Friday by the gang at the Orimerunmu area of Ketu. Policemen from Mowe Division of the command reportedly rescued Oyekanmi around 1am on Saturday in a hotel at Mowe, Obafemi-Owode Local Government Area of the state.. The victim was taken to the hotel, while the gang demanded a ransom. The state Police Public Relations Officer, Abimbola Oyeyemi, told SUNDAY PUNCH that the victim was kidnapped by the gang while she was running an errand for her parents. He said, “She was taken to a hotel in Mowe where the kidnappers kept her and started demanding a ransom. They ran out of luck when the anti-robbery team from Mowe Division, led by the Divisional Police Officer, Francis Ebohuwa, got a tip-off and stormed the hotel. One of the suspects was arrested while others escaped. The victim was rescued unhurt.”Oyeyemi said the state Commissioner of Police, Ahmed Iliyasu, had ordered a manhunt for the members of the gang who escaped. He said Iliyasu had also directed that the suspect be transferred to the Anti-kidnapping Unit of the command headquarters at Eleweran, Abeokuta, for further investigation. The Question Is 'How Do Wapbaze;codedclass;stella9ja and lots of website source bcos i observe all of dem post d same answers at d same time inspite d amount u've paid for early runz?? ?If u no d source;Comment pls?? Apericpation for this information is over 9000-thank you!